Chin-up posture due to congenital ptosis of the left eye. 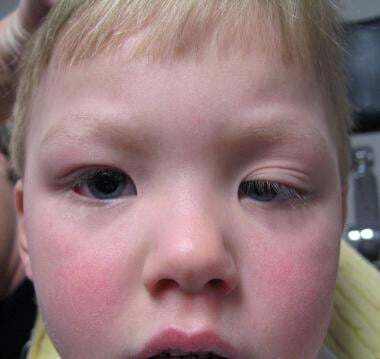 Congenital ptosis of the left eye partially obstructing the left pupillary axis. Congenital ptosis of the right eye. Ptosis can affect one eye or both eyes and can present at birth or be more apparent later in childhood. Ptosis that is present at birth or within the first year of life is called congenital ptosis. Most cases of congenital ptosis are isolated and do not affect vision, but refractive errors and amblyopia should always be excluded. Any ptosis that develops over a period of days or weeks can signal a serious medical problem and needs further neurologic and physical evaluation. The frequency of congenital ptosis in the United States has not been officially reported. However, in approximately 70% of known cases, congenital ptosis affects only one eye. The incidence rate of congenital ptosis worldwide is unknown. Guercio JR, Martyn LJ. 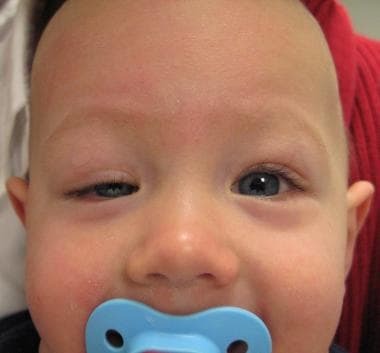 Congenital malformations of the eye and orbit. Otolaryngol Clin North Am. 2007 Feb. 40(1):113-40, vii. [Medline]. Berry-Brincat A, Willshaw H. Paediatric blepharoptosis: a 10-year review. Eye (Lond). 2009 Jul. 23(7):1554-9. [Medline]. Mendes S, Beselga D, Campos S, Neves A, Campos J, Carvalho S, et al. 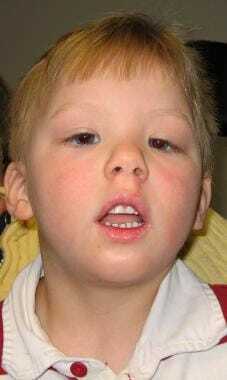 Possible rare congenital dysinnervation disorder: congenital ptosis associated with adduction. Strabismus. 2015. 23 (1):33-5. [Medline]. Decock CE, De Baere EE, Bauters W, Shah AD, Delaey C, Forsyth R, et al. Insights into levator muscle dysfunction in a cohort of patients with molecularly confirmed blepharophimosis-ptosis-epicanthus inversus syndrome using high-resolution imaging, anatomic examination, and histopathologic examination. Arch Ophthalmol. 2011 Dec. 129 (12):1564-9. [Medline]. Tzschach A, Kelbova C, Weidensee S, Peters H, Ropers HH, Ullmann R, et al. Blepharophimosis-ptosis-epicanthus inversus syndrome in a girl with chromosome translocation t(2;3)(q33;q23). Ophthalmic Genet. 2008 Mar. 29 (1):37-40. [Medline]. Wabbels B, Schroeder JA, Voll B, Siegmund H, Lorenz B. Electron microscopic findings in levator muscle biopsies of patients with isolated congenital or acquired ptosis. Graefes Arch Clin Exp Ophthalmol. 2007 Oct. 245(10):1533-41. [Medline]. Bagheri A, Aletaha M, Saloor H, Yazdani S. A randomized clinical trial of two methods of fascia lata suspension in congenital ptosis. Ophthal Plast Reconstr Surg. 2007 May-Jun. 23(3):217-21. [Medline]. Philandrianos C, Galinier P, Salazard B, Bardot J, Magalon G. Congenital ptosis: long-term outcome of frontalis suspension using autogenous temporal fascia or fascia lata in children. J Plast Reconstr Aesthet Surg. 2009 Apr 10. [Medline]. Chong KK, Fan DS, Lai CH, Rao SK, Lam PT, Lam DS. Unilateral ptosis correction with mersilene mesh frontalis sling in infants: thirteen-year follow-up report. Eye (Lond). 2010 Jan. 24(1):44-9. [Medline]. Lee MJ, Oh JY, Choung HK, Kim NJ, Sung MS, Khwarg SI. Frontalis sling operation using silicone rod compared with preserved fascia lata for congenital ptosis a three-year follow-up study. Ophthalmology. 2009 Jan. 116(1):123-9. [Medline]. Ho YF, Wu SY, Tsai YJ. Factors Associated with Surgical Outcomes in Congenital Ptosis: A 10-Year Study of 319 Cases. Am J Ophthalmol. 2016 Dec 28. [Medline]. Bernardini FP, Devoto MH, Priolo E. Treatment of unilateral congenital ptosis. Ophthalmology. 2007 Mar. 114(3):622-3. [Medline]. Yoon JS, Lew H, Lee SY. Bell's phenomenon protects the tear film and ocular surface after frontalis suspension surgery for congenital ptosis. J Pediatr Ophthalmol Strabismus. 2008 Nov-Dec. 45(6):350-5. [Medline]. Salour H, Aletaha M, Bagheri A. Comparison of Mersilene mesh and autogenous fascia lata in correction of congenital blepharoptosis: a randomized clinical trial. Eur J Ophthalmol. 2008 Nov-Dec. 18(6):853-7. [Medline]. Bergin DJ. Management and surgery of congenital and acquired ptosis. Continuing Ophthalmic Video Education. 1990. Clark BJ, Kemp EG, Behan WM, Lee WR. Abnormal extracellular material in the levator palpebrae superioris complex in congenital ptosis. Arch Ophthalmol. 1995 Nov. 113(11):1414-9. [Medline]. Malone TJ, Nerad JA. The surgical treatment of blepharoptosis in oculomotor nerve palsy. Am J Ophthalmol. 1988 Jan 15. 105(1):57-64. [Medline]. Meyer DR, Rheeman CH. Downgaze eyelid position in patients with blepharoptosis. Ophthalmology. 1995 Oct. 102(10):1517-23. [Medline]. Weinberg DA, Lesser RL, Vollmer TL. Ocular myasthenia: a protean disorder. Surv Ophthalmol. 1994 Nov-Dec. 39(3):169-210. [Medline]. Yilmaz N, Hosal BM, Zilelioglu G. Congenital ptosis and associated congenital malformations. J AAPOS. 2004 Jun. 8(3):293-5. [Medline]. I would like to thank my family for their patience and unremitting support.